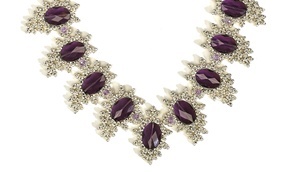 Triangular appeal by Anu Rao - Get the look of a high-end necklace with triangle beads worked in ladder stitch around large oval crystals. 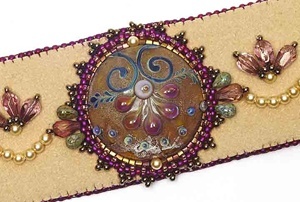 Tuscan sunset cuff by Julia Gerlach - Set off the Bead&Button anniversary focal using just a few bead-embroidered accents on an Ultrasuede band. 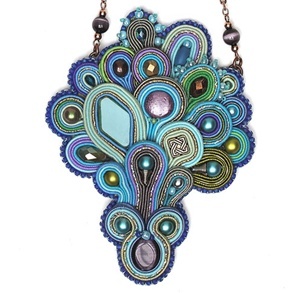 Oh, lolly, lolly pendant by Amee K. Sweet-McNamara - Create "lollipops" from scraps of soutache and leftover beads, and then layer them in a shapely pendant. 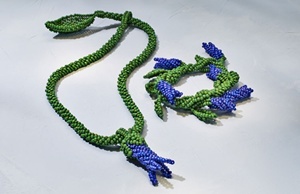 Organic twist bracelet & necklace by Kerrie Slade - Add depth to this jewelry set with striped seed beads worked in twisted tubular herringbone and brick stitch. 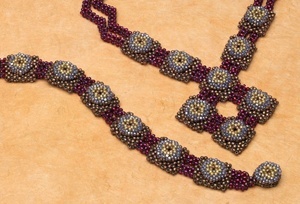 Do the bump by Kathleen Stauber - Embellish cubic right-angle weave with peyote stitch medallions in this necklace and bracelet. 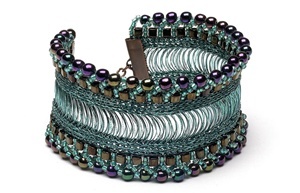 Metallic lace bracelet by Jimmie Boatright - Create a beaded edging for a WireLuxe band using ladder stitch, brick stitch, cubes, and round beads. 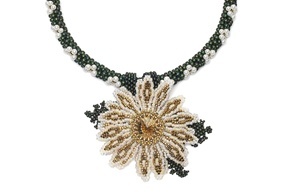 Fresh as a daisy necklace by Wendy Speare - Update the traditional daisy chain with a floral kumihimo rope, a brick stitch daisy pendant, and peyote leaves. 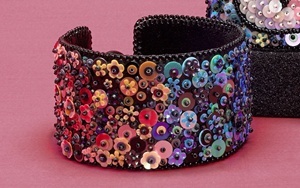 Rainbow bright bracelet by Sarah Meadows - Decorate a band with colorful (and economical!) 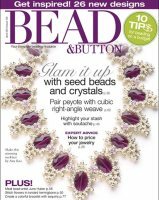 sequins attached with an easy bead-embroidery stitch. 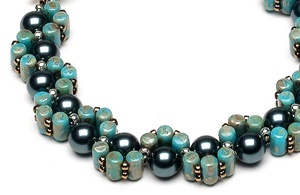 Chic & Easy: Rulla wave bracelet By Connie Whittaker - Stitch semicircles of Rulla beads around a handful of peals in this curvy, casual band. 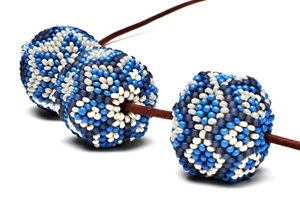 Design Workshop: Patterned beaded beads By Pamela Jensen - Work a pretty pattern of right-angle weave and decreasing peyote stitch around a wooden bead. 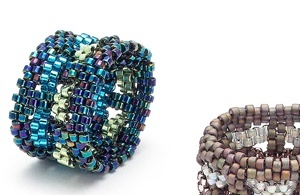 Quick Stitch: Basketweave rings By Nina Raizel - Thread bands of beadwork around and through the windows of a peyote stitch ring. 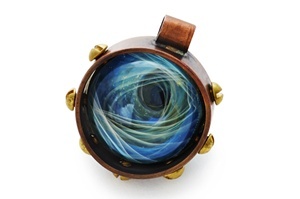 Artist Spotlight: James Yaun and Nadja Gustafson By Stacy Werkheiser - Janes Yaun and Nadja Gustafson make fascinating (and surprisingly large) beads, marbles, and more from glass.